This article was originally published in a shorter form on ArtWay.eu. All photos are courtesy of the Keiskamma Trust; click to enlarge. 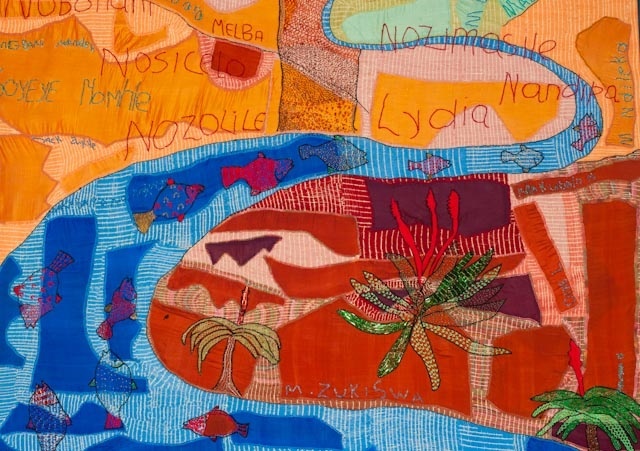 Created by about 130 Xhosa—mainly women—living along the Keiskamma River in South Africa’s Eastern Cape , the monumental Keiskamma Altarpiece is a memorial to community members who died of AIDS and an homage to the strength and agency of the women left behind. 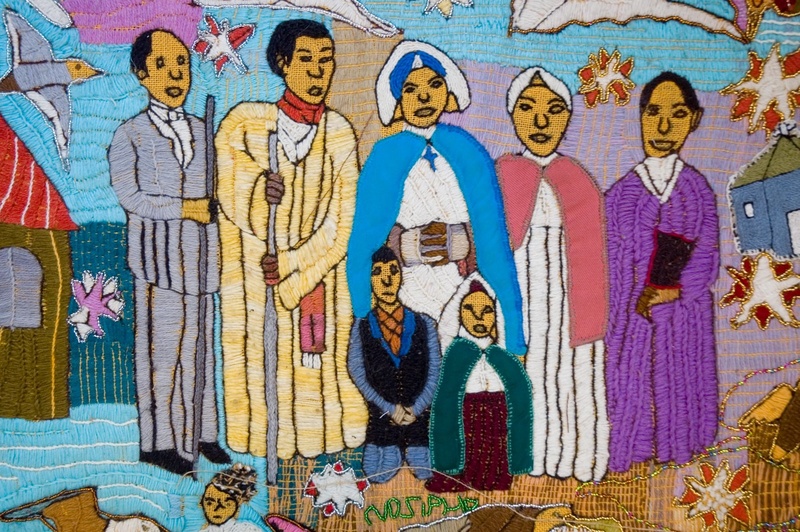 Consisting of embroidery, beadwork, wire sculpture, and photography, the altarpiece mourns loss, but more important, it prophesies hope and redemption for the village of Hamburg, providing a vision for residents to live into. 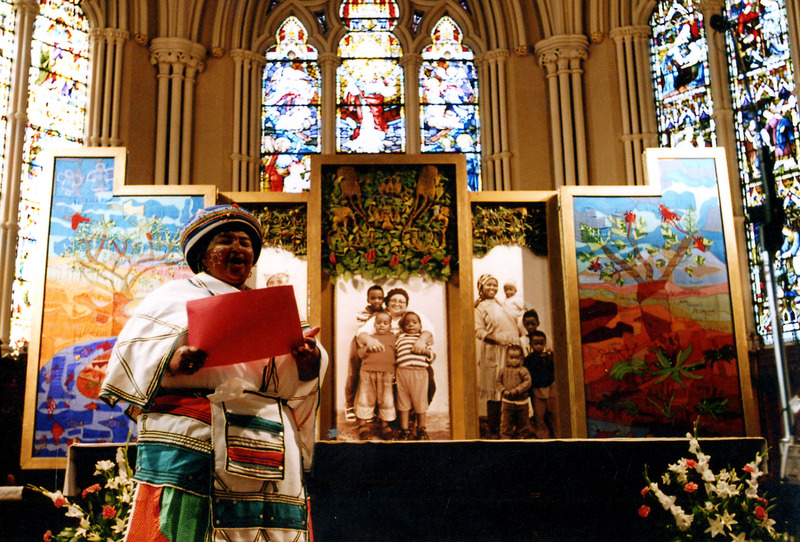 South African health-care worker Eunice Mangwane presents the Keiskamma Altarpiece at the Cathedral Church of St. James in Toronto, the first stop on its North American tour in 2006. Mangwane is commemorated in the central panel of the altarpiece’s fully open view, pictured above. Matthais Grünewald, Isenheim Altarpiece (closed view), 1515. Oil on wood. 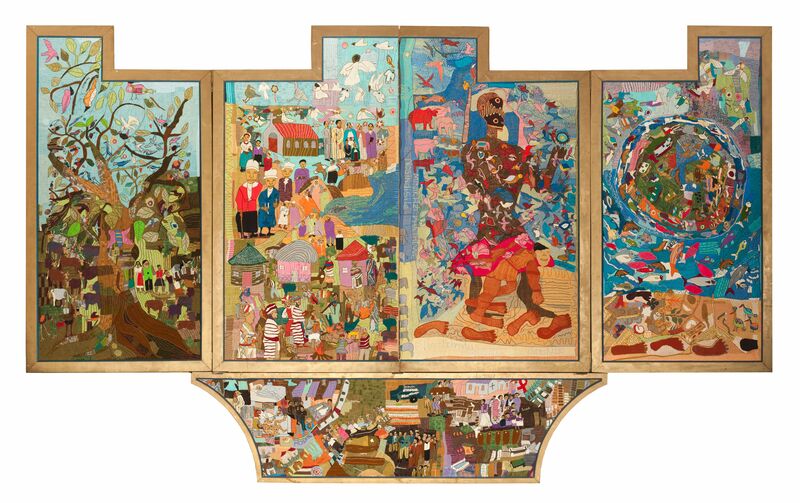 The Keiskamma Altarpiece draws on the Isenheim’s imagery of suffering, death, and resurrection but adapts it to the local context of Hamburg and its experience of the modern AIDS epidemic. 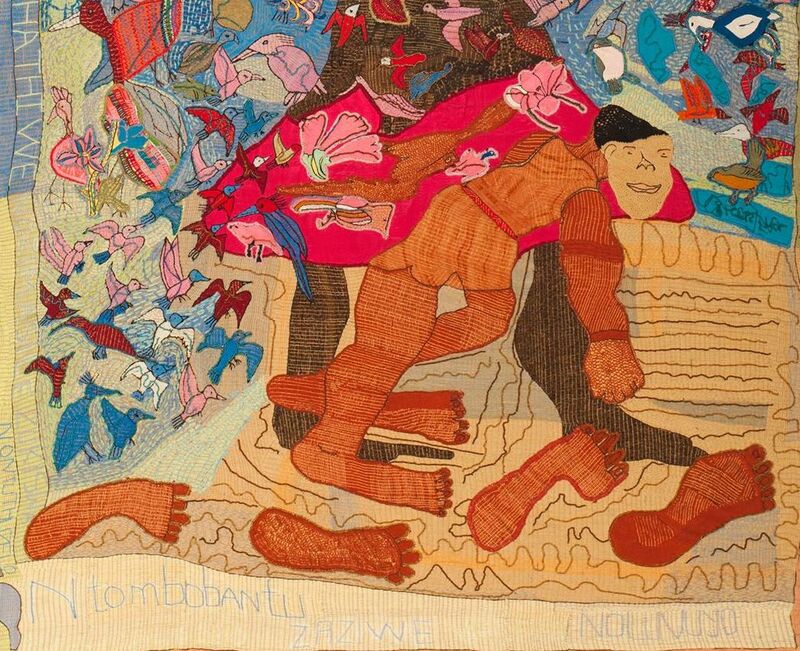 In making this work the artists sought to draw a parallel between AIDS and other diseases that once seemed hopeless but that are now no longer a threat. 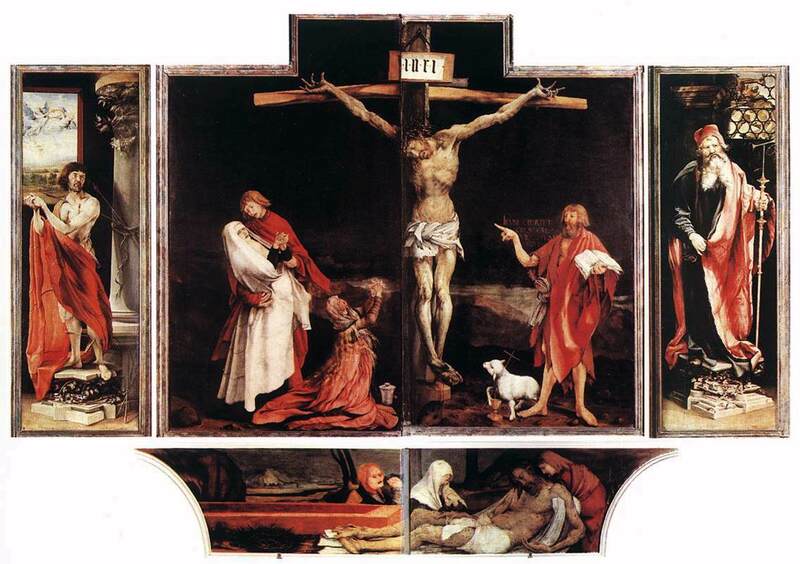 Like Grünewald’s, the altarpiece is constructed as a series of hinged panels—fourteen in all—that open to create three different configurations. The one panel that remains constant in all three views is the predella at the bottom. This long supporting plinth depicts the funeral of Dumile Paliso, 35, echoing the Lamentation over the Dead Christ panel of Grünewald’s original. 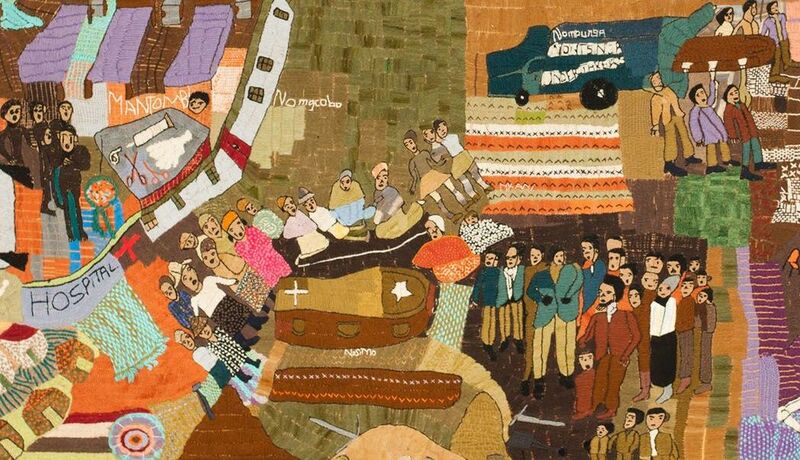 Detail of the predella depicting the funeral of AIDS victim Dumile Paliso. 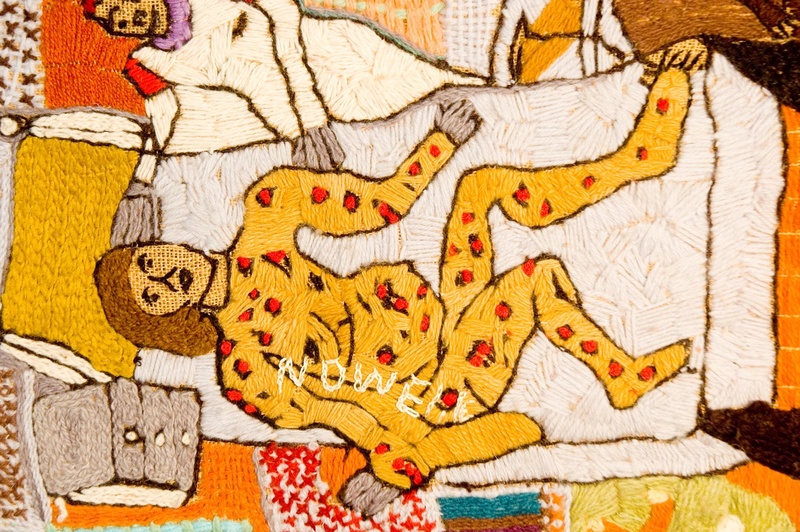 Detail of an AIDS sufferer covered with pustules, lying in the ward where Dumile was treated. Keiskamma Altarpiece (closed view), 2005. 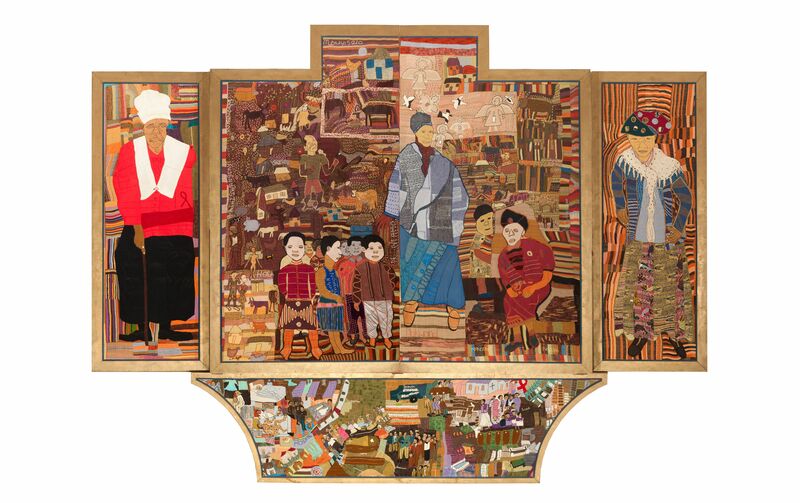 Mixed media, 4.15 × 6.8 m (13.6′ × 22.3′). Click to enlarge. Detail of AIDS orphans. I wondered whether the light tone of their faces signified some kind of ritual (Xhosa boys do paint their faces white during their initiation into manhood), but Hofmeyr told me that no, it’s just difficult to render facial features on dark colors! While the representations in the center are meant to be generic, those on the wings are of specific figures in the community. Lagena Mapuma (now deceased ) is dressed in the red, white, and black uniform of the Methodist Women’s Prayer and Service Union ; the grandmother of a large family, many of whom are HIV-positive, she remained stalwart in the face of devastation and was a great support to those in need. On the other side is Susan Paliso, who at age 82 took on the responsibility of raising her grandson Lihle after her son Dumile died of AIDS. These elder women, pillars of the community, are pictured where Grünewald placed Saints Sebastian and Anthony the Great. Keiskamma Altarpiece (first open view), 2005. Mixed media, 4.15 × 6.8 m (13.6′ × 22.3′). Click to enlarge. Detail of worshipers from various Christian denominations, all of which have representation in Hamburg, the two most popular being Methodist and Anglican. Detail of crazy-for-God Gaba, who casts a massive red-skirted shadow behind him. 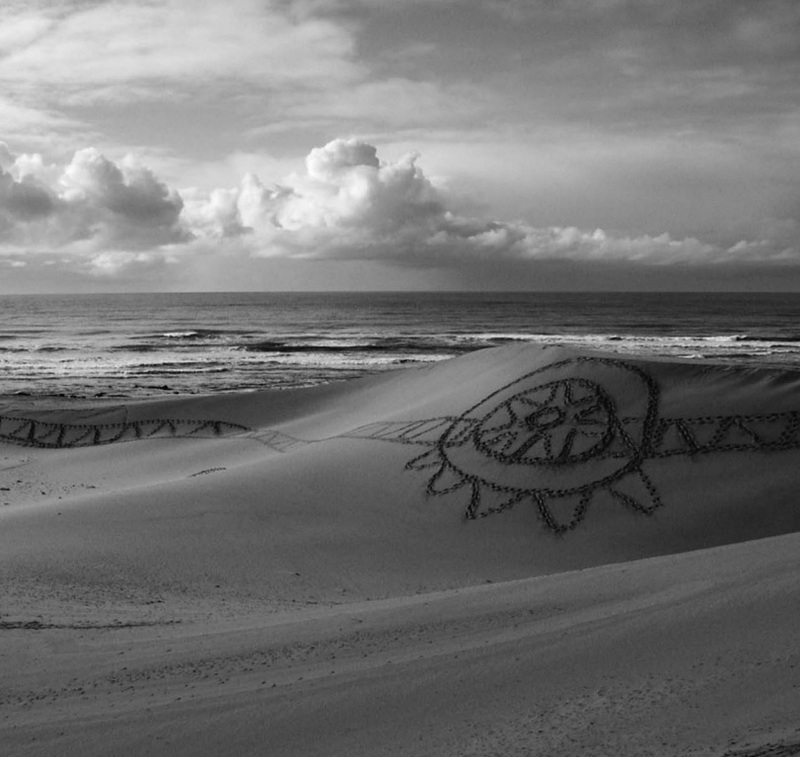 An ephemeral sand drawing, or sand prayer, by Vuyisile “Gaba” Funda, danced out before dawn. Keiskamma Altarpiece (second open view), 2005. Mixed media, 4.15 × 6.8 m (13.6′ × 22.3′). Click to enlarge. Nyongo has five daughters and many grandchildren (only four are pictured here), all of whom live with her in Hamburg. A gifted artist, she led the group that created the wire sculpture and beadwork above the photographs in this section, which update the lime wood latticework of Grünewald’s altarpiece. Here zoomorphic emblems of the four Gospel writers—also present in the Isenheim—perch on a coral tree, and birds roost on neighboring acacias. Detail of a winged ox, a traditional symbol of the evangelist Luke (because his Gospel emphasizes the theme of sacrifice). Detail of the Keiskamma River, which is thought by locals to have healing powers, it being the supposed dwelling place of their ancestors. 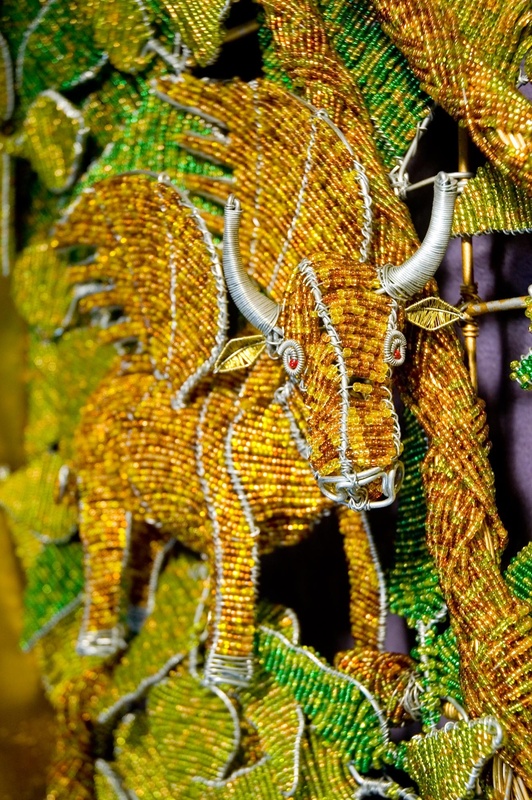 The beaded names signify those who have died of AIDS, whereas the embroidered names are those of the artists. 1. ^ Most of the artists are from Hamburg, but some came from the neighboring villages of Bodium, Ntilini, and Bell. 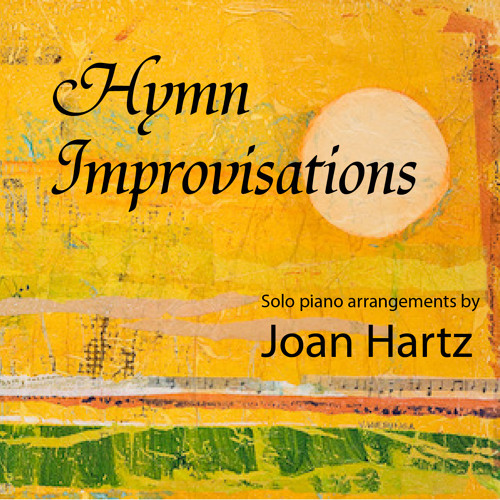 Of the approximately 130 people who contributed to the altarpiece, only a handful were men, including Justus Hofmeyr, Carol’s husband, who created the wooden framework. 2. 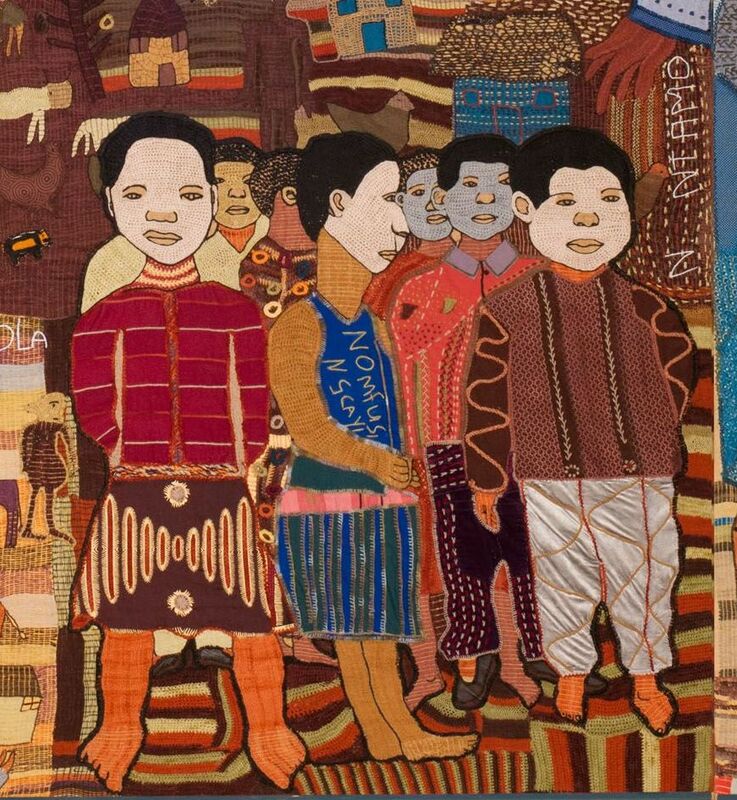 ^ Embroidery and appliqué in the form of beading, buttons, and strips or shapes of other material were already common art forms in Xhosa society prior to the establishment of the Keiskamma Trust. But the Keiskamma Altarpiece project introduced new, related techniques to artists: Jan Chalmers and Jacky Jezweski were brought in from the UK to teach stump work, a type of raised embroidery, and Ardwork Eddie Jange from the Cape Town organization Streetwires taught them how to create three-dimensional forms using beaded wire. 3. 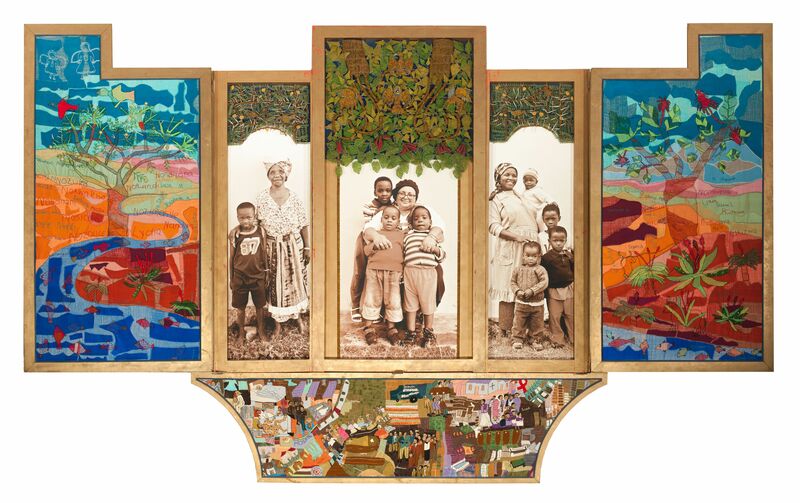 ^ Lagena Mapuma passed away in 2005 shortly after the altarpiece was completed. 5. ^ In an e-mail to me dated September 13, 2015, Hofmeyr wrote that most people in Hamburg belong to a Christian church of some kind and have deep personal faith in Jesus but also maintain traditional beliefs about ancestors, who are said to maintain relations with the living and serve as a source of good or bad fortune. For more on the interplay between the two religious systems, see B. A. Pauw, Christianity and Xhosa Tradition (Cape Town: Oxford University Press, 1975). 6. ^ Quoted secondhand in Brenda Schmahmann, “A Framework for Recuperation: HIV/AIDS and the Keiskamma Altarpiece,” African Arts 43, no. 4 (Autumn 2010): 47. 7. ^ Keiskamma Songbook: Aquarium (Keiskamma Trust: Hamburg, Eastern Cape, South Africa, 2010), 40. For more on Gaba, see The Dune Runner, a short film by Carol’s sons, Graeme and Robert Hofmeyr. 8. ^ Tanya Jordaan took these three photographs and worked as a supervisor on the project. 9. ^ For more about Eunice Mangwane, see season 1, episode 16 of the SABC television documentary series I Am Woman, Leap of Faith. This entry was posted in Non-Western Art and tagged African altarpiece, AIDS art, AIDS in church, AIDS in South Africa, redemption in suffering, Xhosa Christianity. Bookmark the permalink.